These four ways to clean copper pots and pans are surprisingly effective - and chemical free. 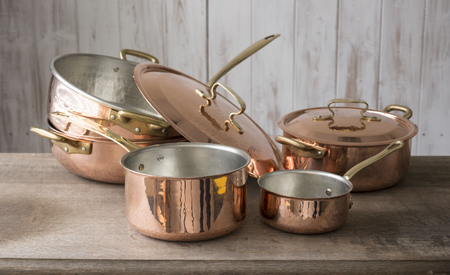 You can often clean copper cookware with inexpensive, homemade cleaners made from items likely already in your kitchen. Be sure to wear gloves to protect copper's surface from fingerprints during the cleaning process. Always clean copper pots and pans with a nylon scrubbing pad or a soft sponge; stay away from anything abrasive, such as steel wool or scouring powder. These could scratch the finish. Here are 4 ways to clean copper cookware with inexpensive, homemade, and eco friendly items you probably already have in your kitchen. Cleaning copper with vinegar and salt works wonders on copper bottom pans. Mix white vinegar and table salt, and stir until the salt dissolves, creating a thick paste. Add salt as needed. Dip a sponge or scrubber into the solution, and scrub the pan's copper bottom surface. Rinse and dry. A lemon and salt paste is a natural tarnish remover works. Strain the juice from one lemon, or pour a few generous drops of lemon juice into a small container. Add salt until the mixture forms a paste-like texture. Using a soft, dry cloth, rub the paste over the copper. Rinse with warm water. Polish with with a soft cloth lightly moistened with olive oil for a shiny finish. Allow to air dry. Yes, cleaning with ketchup. Sounds crazy, I know. But ketchup's acidity makes it a natural tarnish remover. Squeeze a light film of ketchup onto the copper surface. Let sit for several minutes to allow ketchup's acidity begin to do its work. Then scrub vigorously with a nylon scrubbing pad or soft sponge. Rinse thoroughly. Polish copper to a shiny finish with a cloth lightly moistened with olive oil. Allow to air dry. This solution you can make and keep the extra in a lidded glass jar for future use. Mix 1/2 each of flour, salt, and powder detergent. Add 3/4 cup white vinegar, 1/4 cup lemon juice, and 1/2 cup water in a glass jar. Pour a small amount onto a nylon scrubbing pad or soft sponge and rub it into the tarnished copper bottom. Rinse thoroughly with water, and polish dry with a soft, lint-free cloth. Label and seal the left over portion for future copper polishing. To prevent tarnished coppering the future: Don't use your copper utensils or pans with copper interiors to store acidic foods such as fruits, salad dressings, tomatoes, or anything containing vinegar. Toxic compounds can form if acidic food is cooked, stored, or served in copper containers.